Any info on how tire age affects temps? I have blown two inside duals on my class a. The last one was a 10 year old tire. As to the first one, I am not sure. Haven't seen any data to indicate any meaningful difference in heat generation of old vs new rubber. I would think it possible that the inner dual runs a bit hotter than the outdise dual due to shielding from airflow but on the otherhand the inner tire is shielded from direct sunlight. Side issue. When your inner tire "blew" what did you do about the outer tire? Did the tire that lost air have all it's air right up to the instant it "blew", or was their a slow leak? Any time you loose air in one dual you are overloading the other tire and potentially doing serious internal structural damage. I have read reports of the 2nd dual failing days to weeks after it's mate suffered a puncture. I was told that the best way to test temp. 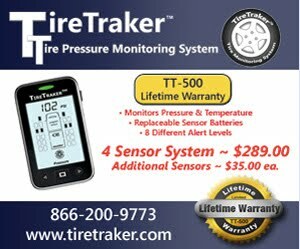 on tires is to buy a infared temp gun from Harbor Freight (about $25) and you can point it at the tire side wall and get a more accurate temp reading than with the TPMS. I really think the TPMS are great for letting you know if you have a slow leak such as a screw or nail. Temp will be a product of the pressure going down.